An overwhelming majority of Google Play’s revenue in the South Korean market is generated by games provided on the mobile app marketplace, industry tracking data released Tuesday showed. 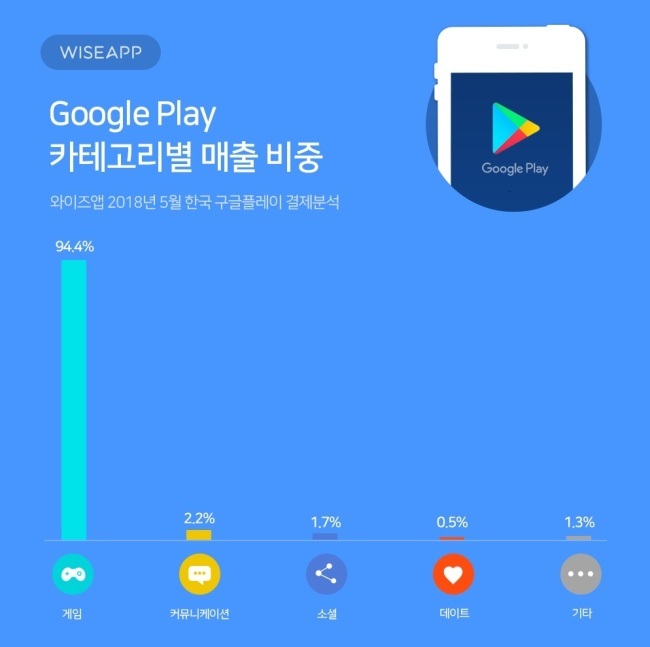 According to local app analytics firm WiseApp, the games category took up 94.4 percent of revenue generated on Korea’s Google Play, the biggest app marketplace for mobile devices running on the Android operating system. Revenue on Google Play refers to tax-exclusive funds generated by app sales — where users have to pay a fee to download an app — as well as in-app purchases, which refers to purchases made from within a mobile app that can be downloaded for free. After mobile games, the remainder of the revenues on Google Play were generated by the messaging and communication app category (2.2 percent), social media app category (1.7 percent), dating app (0.5 percent) and others (1.3 percent). WiseApp’s data was based on a sample survey of 23,000 Android smartphone users in Korea, which was adjusted to reflect the breakdown of the smartphone user demographic here. The data applies to the period spanning from May 1-31.